The statistical description of the ANIBES sample population sample is included in Table 1. A total of 434 products were identified from consumption of participants of the ANIBES Study, and by including different brands (traditional vs. distribution), we compiled 1164 foods and beverages (3037 photographs). Table 1. Statistical description of the sample ANIBES (Modified from Nissensohn et al., 2016 ). From analyzed brands, 42% of products included some type of added sugars and 10% contained LNCS in their composition. Only 5.1% of the products had added sugars and LNCS declared on their labels. Table 2 shows the distribution of presence (%) of added sugars and LNCS in each of the food groups consumed. Table 2. 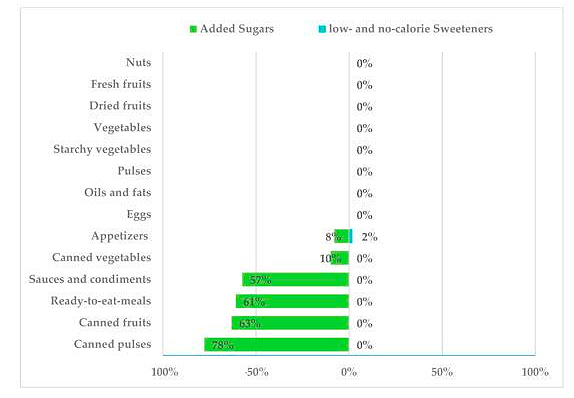 Presence of added sugars and low- and no-calorie sweeteners (LNCS) across the food groups consumed in the ANIBES Study. In the following figures, the presence of added sugars in different food subgroups is shown on the left hand side (independent of their LNCS content), while, on the right hand side, the presence of LNCS independently of sugar content for each food subgroup is presented. Figure 2 shows added sugar and LNCS content of non-alcoholic beverages. Water, coffee and infusions, and natural fruit juices had no added sugars or LNCS. Soya drinks included LNCS in 45% of assessed products. Diet soft drinks contained LNCS in 100% of assessed products, followed by “other drinks” (68%, alcohol-free biter, alcohol-free beer, juice, milk mixes, etc.). Noteworthy, 70% of the last group had added sugars. In turn, 100% of sugar soft drinks had added sugars and 24% LNCS, followed by energy drinks in which 96% of assessed products added sugars and 34% contained LNCS. 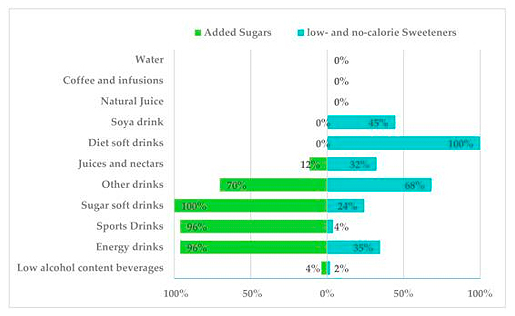 Additionally, in the sports drinks category, 96% had added sugars but only 4% LNCS. Of all the juices and nectars assessed, 32% contained LNCS, whereas 12% contained added sugars. Finally, only 4% of the low alcohol content beverages present in the survey had added sugars (beers, bitter, sangria, cider and combined low-graded), whereas 2% contained only LNCS. Combined low alcohol content beverages presented LNCS in 76.7% of the assessed and 60% added sugars (data not shown). The major forms of added sugars in these groups were sucrose, glucose, fructose, glucose-fructose syrup and caramel. Main LNCS were acesulfame-k (E-950), aspartame (E-951), cyclamic acid or cyclamate (E-952), saccharine (E-954), sucralose (E-955) and neosperidine DC (E-959). Data from alcoholic beverages were not assessed, as ingredient information was unavailable on most product labels. Figure 2. Presence of added sugar and low- and no-calorie sweeteners in beverages consumed by the Spanish ANIBES Study. Within the “grains” group, all recorded bakery and pastry products had added sugars (Figure 3). These were mainly sugar, dextrose, glucose-fructose syrup, glucose syrup, inverted sugars, trehalose and caramel. However, only 17% of products contained LNCS such as sorbitol (E-420) (e.g., muffins, strudel and cakes) used at quantum satis level as a humectant. Figure 3. Presence of added sugars and low- and no-calorie sweeteners in grains consumed by the Spanish ANIBES population. Added sugars were present in 96% of breakfast cereals and cereal bars products, namely sugar, dextrose, glucose-fructose syrup, glucose syrup, inverted sugars, trehalose, corn glucose and fructose syrup and caramel. About only 4% from this group contained LNCS: mainly cereal bars, regular and whole, being E-420 the unique LNCS used at quantum satis levels for purpose other than sweetening. Bread and bread products (derivatives) presented added sugars in 81% of assessed products (sugar, glucose-fructose syrup, inverted sugars and lactose). Interestingly, no LNCS were reported in this subgroup. Added sugars were present in 2% of milk products (Figure 4), specifically, in condensed milk. Similarly, cheeses contained added sugars in only 3% of reported products. None of these two groups contained LNCS. However, “other dairy products”, a subgroup that comprised milkshakes, dairy desserts and ice cream, reported 82% of products containing added sugars, namely, ice cream contained sugar in 100% of products (sugar, caramel, glucose-fructose syrup, lactose and dextrose). In addition, yogurt and fermented milk products had added sugars in a high proportion of reported products (63%, sucrose, glucose, fructose, lactose and glucose-fructose syrup), while 18% of products in this subgroup had LNCS, mainly acesulfame-k (E-950), aspartame (E-951), cyclamate (E-952) and sucralose (E-955). Figure 4. Presence of added sugars and low- and no-calorie sweeteners in milk and dairy products consumed by the Spanish ANIBES population. In the “sugar” (table sugar) and “chocolates” group, 100% of products only contained added sugars (sucrose, honey, lactose and dextrose) and no LNCS were declared in their labels (Figure 5). Jams and others presented added sugars in 89% of products, namely sucrose and glucose-fructose syrup; conversely, LNCS were present in roughly 10% of this group (sorbitol (E-420), mannitol (E-421), acesulfame-k (E-950), aspartame (E-951), cyclamate (E-952), sucralose (E-955) and stevia (E-960)). Figure 5. Presence of added sugars and low- and no-calorie sweeteners in sugar and sweets consumed by the Spanish ANIBES population. Other sweets, including candy, chewing gum, marzipan, licorice and “turron” (a traditional Spanish type of nougat) had added sugars in 13% of assessed products (sucrose, glucose-fructose syrup, honey and inverted sugars) while 89% had LNCS (sorbitol (E-420), mannitol (E-421), acesulfame-k (E-950), aspartame (E-951), cyclamate (E-952), saccharine (E-954), sucralose (E-955) and xylitol (E-967)). In the following group, “meat” and “fish” refers to unprocessed products (only refrigerated or chilled cuts). Sausages and other meat products and fish derivatives encompass those processed products that might contain ingredients other than meat in their composition. Presence of added sugars was observed in 86% of the sausages and other meat products subgroup (i.e., sausages, bacon, chorizo, etc.) and in 14% of fish derivatives (Figure 6), mainly sucrose, dextrose, lactose and glucose and dextrose syrup. LNCS were present in 8.5% of sausages and other meat products (sorbitol, E-420) but not in the second subgroup. Figure 6. Presence of added sugars and low- and no-calorie sweeteners in meat and fish and derivate products consumed by the Spanish ANIBES population. Canned pulses and fruits presented higher proportions of products containing added sugars, 78% and 63%, respectively, while only 10% of assessed canned vegetables did (Figure 7). As for “ready-to-eat meals”, we observed that 61% of assessed products had added sugars (sucrose, lactose, caramel, and corn dextrose and glucose syrup). Appetizers had added sugars in 8% of products (sucrose, glucose-fructose syrup and glucose syrup) and LNCS in 2% (aspartame, E-951). Finally, amongst sauces and condiments, 57% of assessed products had added sugars such as sucrose, caramel, lactose and glucose-fructose syrup. Figure 7. Presence of added sugars and low- and no-calorie sweeteners in other food groups consumed by the Spanish ANIBES population. Table 3 and Table 4 show the prevalence of the different types of added sugars and LNCS found, respectively. Overall, sucrose was the major added sugar ingredient (Table 2). Aspartame (E-951) and acesulfame K (E-950) were the most used LNCS across the different studied food groups, while neosperidine DC (E-959) was employed only in the non-alcoholic beverages category (Table 3). Table 3. Prevalence of type of added sugars declared on food products with added sugar consumed by the ANIBES study population. 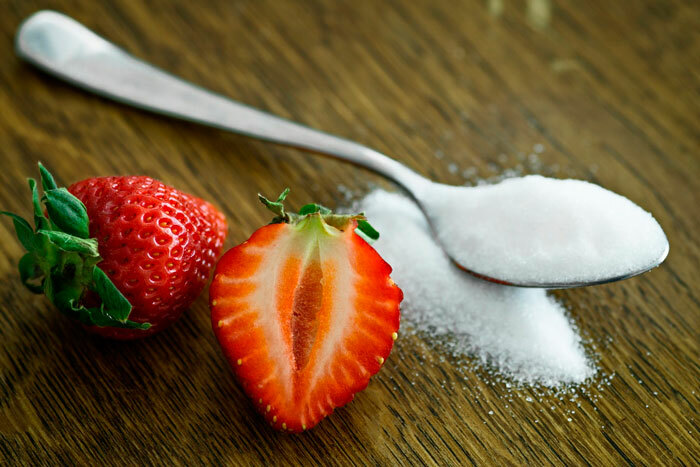 Only those added sugars which contribute to at least 1% of intakes have been included, calculated as percentage of assessed products containing added sugars. Table 4. Prevalence of type of Low- and no-calorie sweeteners (LNCS) declared on food products with LNCS consumed by the ANIBES study population.